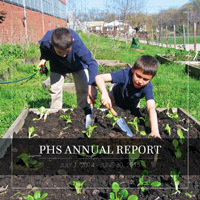 Pennsylvania Horticultural Society took grand prize for a story map of the organization’s 2015 annual report. Redlands, California—Today Esri announced the winners of its 2016 Storytelling with Maps Contest at the Esri User Conference in San Diego. The Pennsylvania Horticultural Society took grand prize for a story map of the organization’s 2015 annual report. The contest, which had a record-breaking 965 submissions, invites individuals and organizations to create narratives using Esri Story Map apps that combine interactive maps with multimedia content. Esri also announced two new Story Map apps, Cascade and Crowdsource. The former has full-screen scroll to enable immersive media-rich experiences, and the latter allows people to share photos and experiences. “Story maps are a new medium that taps the insights of geography and the power of interactive maps to enable anyone to create beautiful, useful, and informative narratives about pretty much any topic under the sun,” said Allen Carroll, program manager for storytelling at Esri and one of the contest’s judges. For more information about Esri Story Maps, visit storymaps.arcgis.com. To view all 16 winning story maps, visit the winner’s gallery web page or the special 2016 Storytelling with Maps Contest Story Map.